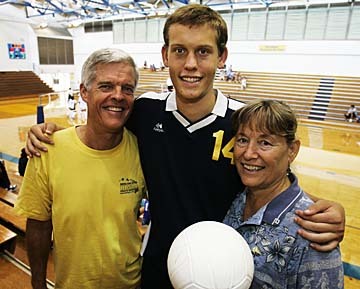 Two-time Star-Bulletin All-State player of the year Spencer McLachlin of Punahou is the son of long-time volleyballers Chris and Beth McLachlin. THE doctor says Punahou's Spencer McLachlin has stopped growing. "But then again, he said I'd only be 6-1," McLachlin said. One look at him, and it's immediately apparent he's an athletic stud. With a broad 6-foot-7 frame, the Buffanblu senior towers over most, including his grandfathers, father and brother, all 6-1. "We can't figure out where the height came from," said mother Beth. "He's 6-7 with his shoes on. I think he's still growing. He might grow another inch or so." Add to his height and athletic genes a family that knows volleyball inside and out, and the product is a two-time, and most likely three-time, state player of the year. "I guess I kind of grew up in a gym," Spencer said. Being born a McLachlin almost guaranteed that Spencer would be destined to become an accomplished athlete. Beth, currently coaching the La Pietra intermediate volleyball squad, was a U.S. national team member. His father, Chris, a volleyball commentator, coached the Punahou basketball and volleyball teams to multiple state championships while Spencer was only a toddler. His sister, Bekka, was a standout on the Buffanblu girls squad. And his brother, Parker, who also played for the Buffanblu volleyball squad, is 24th on the Nationwide Tour money list, four spots out from landing a PGA Tour card. "I tried golf when I was younger, but it was too slow for me," said Spencer. "My brother has a different kind of attention (span) than I do. He can focus for 4 or 5 hours on a golf course. But I get frustrated too easily with that game." Spencer McLachlin, a self-proclaimed average student going into ninth grade, has a 3.6 grade-point average. As a water boy for his siblings' varsity teams, Spencer spent a lot of time around the Buffanblu program, and became dedicated to a game that was better suited for him. "I got started just hitting balls against the wall, shagging balls," Spencer said. "I loved the whole atmosphere." Volleyball is truly a family affair in the McLachlin household. Being constantly surrounded by volleyball chatter has only helped Spencer become a better player. "If it's not one of my games, it's probably the Wahine, or the UH men, or club volleyball, or beach volleyball," he said of his family's dinner conversation. "It's always something." Even though the high school season lasts less than four months, Spencer keeps busy with a growing list of other endeavors, including basketball, surfing and club volleyball. A member of the Outrigger Canoe Club volleyball team, Spencer has the opportunity that few others get -- the chance to compete with some of the best players in the country at the club level. The Outrigger's roster from last year's squad reads like a Who's Who of local prep volleyball -- Kawika and Erik Shoji, Jordan Inafuku, Jacob Jenkins, Elias David, Kealii Frank, Mana Guerreiro, Will Ehrman, Matthew Brown and Drew Hara, just to name a few. Most of his club teammates are or will be playing for Division I teams, and Spencer said he anxiously looks forward to playing against, or possibly with, his friends in college and beyond. "We all told each other that we can't wait until we're 40 and we can play on the masters, the old-man league," he said. This past summer, Spencer played on his first Junior National Team after competing the last few years at the youth level. Spencer, along with Kawika Shoji and Inafuku, helped the U.S. team easily reach the gold-medal match of the NORCECA Men's Junior Continental Championship at Monterrey, Mexico. The U.S. lost to Cuba in straight sets, finishing with a 4-1 record. "It's always an eye-opening experience playing nationally because it's just a whole other level," said Spencer. "The ball moves so much faster. The guys hit harder, jump higher. After playing there, I really saw where I needed to be." The unchallenged leader of the top-ranked Buffanblu tries to lead his team by example. In addition to working on fine-tuning his already stellar fundamentals, he has dedicated a lot of time in the weight room trying to improve his strength and vertical jump. "The bar keeps being raised on him," said Beth. "If he was just playing high school, he might just be happy just playing and thinking he was at the top. But because he's (played internationally), he knows there's better. He'll have to push himself more to get to the top of that level. And next year, it'll be trying to get at the top of the college level." But no matter how advanced his skills become, Spencer every now and then returns to his first coaches for advice. "I think that since we've been doing this since a young age, he kind of relies on us," Beth said. "He knows we're both volleyball coaches, so he's really good about listening. But he's been playing so long now, it's to the point where dad and I don't say much to him because he knows what to do. "He almost doesn't need us anymore. We're losing our role," she added with a laugh. "The growth potential is huge," Punahou coach Peter Balding said. "When he goes to college and gets the opportunity to train year-round in a specific program, I think he's going to go even higher. And I think that's what the college coaches are seeing." With the Nov. 8 national letter-of-intent signing day little more than month away, Spencer has narrowed his college choices to Pepperdine, UCLA and Stanford. 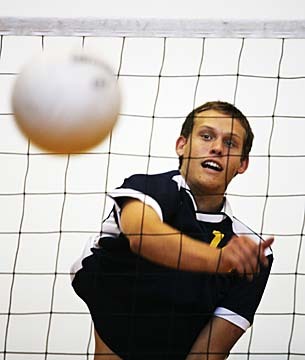 While all programs have top-notch men's volleyball programs, each is also recognized for its rigorous academic standards. "For him to have achieved what he has, it's pretty special," said Chris, who Spencer said pushed him to do better in school. A self-proclaimed average student coming out of the eighth grade, Spencer regularly brought home C's on his report card. But the 18-year-old now proudly holds a 3.6 grade-point average. "I think he's self-motivated now. Before he needed some exterior pushing," Chris said. "I told him, 'You know, the more you study, the more choices you might have in four years.' Try telling that to a 14-year-old." Now the kid who preferred the beach to textbooks has found the joy of the other side of education. During lunch, Spencer helps monitor the Punahou children from kindergarten to third grade. His interaction with the children has helped Spencer decide he wants to be a Spanish teacher. "He remembers when he was that age that older kids did it for him, so it's his way to give back," said Beth.